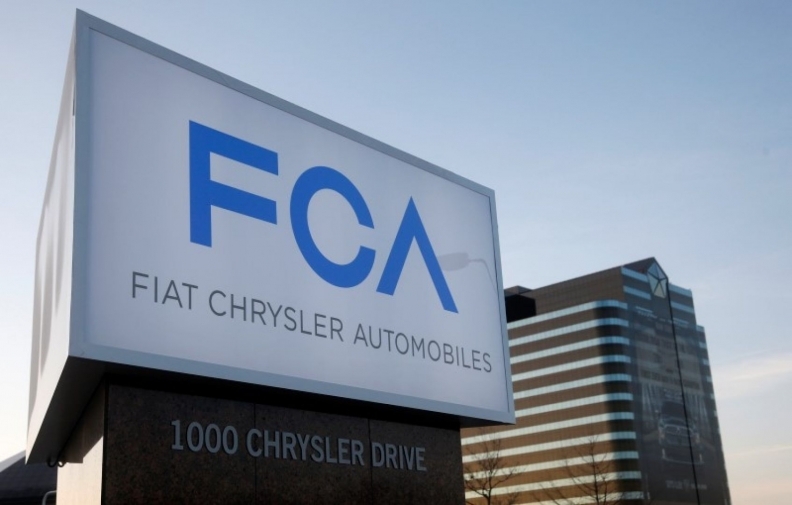 MILAN/DETROIT -- Fiat Chrysler Automobiles said its fourth-quarter earnings before interest and taxes rose 1 percent to 1.5 billion euros ($1.7 billion). Revenue during the quarter also gained 1 percent to 29.7 billion euros ($31.9 billion). Unadjusted net income for the quarter doubled to 409 million euros ($438 million). In a statement, FCA said it expects to nearly halve net debt to below 2.5 billion euros ($2.68 billion) this year -- more than expected -- as the company is in a race against time to prove it can turn cash positive by the end of 2018. The world's seventh-largest carmaker already cut debt to 4.59 billion euros by the end of December, beating analysts consensus expectations of 4.86 billion euros, according to a Thomson Reuters poll. The carmaker said it expects 2017 adjusted EBIT of more than 7 billion euros, up from 6 billion euros last year, while sales are expected to rise to between 115-120 billion euros. For the year, FCA said its earnings before interest and taxes surged 26 percent to 6.1 billion euros ($6.5 billion). The lion's share of those earnings were generated in North America -- 5.1 billion euros ($5.5 billion). In a separate statement, the automaker said about 40,000 hourly workers represented by the UAW would receive an average of $5,000 each in profit sharing checks on Feb. 17. The company said it will retool three assembly plants in Michigan, Illinois and Ohio in 2017. "A total of $2.5 billion will be invested in these facilities to expand the Jeep and Ram brands and will bring 1,700 new jobs to these communities," the statement said. "These actions are planned to be completed by early 2018." Eliminating debt is one of the key challenges CEO Sergio Marchionne faces to fulfill an ambitious financial plan before he retires in 2019. Another obstacle is an investigation announced by U.S. regulators in December over FCA’s alleged failure to disclose emissions-violating software. The company, which has been disputing the claims, didn't say in the statement whether it would be setting aside a provision to cover potential fines and recalls. The company said it's confident it can reach its aim of having at least 4 billion euros of cash by 2018 and posting adjusted earnings before interest and tax of as much as 9.8 billion euros. "FCA this morning provided guidance which is materially ahead of the street," Evercore ISI analyst George Galliers wrote in a note to clients. Fiat improved its profitability across all regions, even as sector sales growth in the U.S. and Europe is slowing amid waning recoveries. In North America, its margin on adjusted earnings before interest and taxes rose to 7.4 percent in 2016 from 6.4 percent a year earlier, as earnings surged 15 percent despite flat sales. Earnings more than doubled in Europe and Asia. 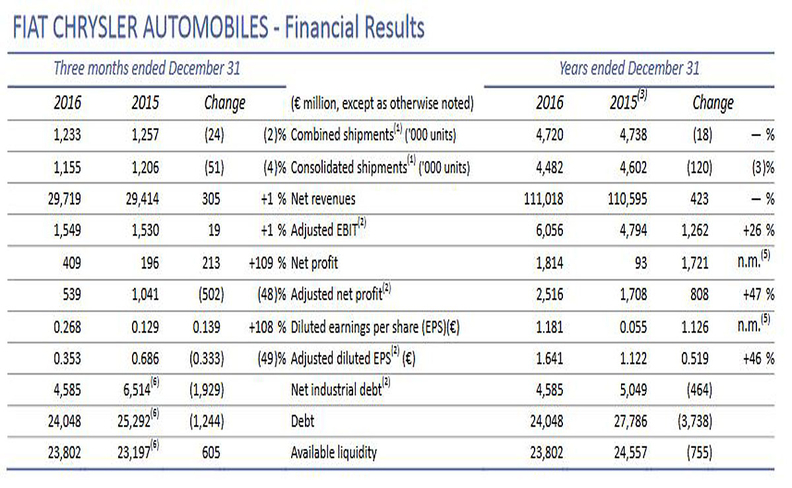 Profitability in all regions was bolstered by demand for the Maserati Levante SUV, which helped the brand more than triple its earnings in 2016 and lift the margin to 9.7 percent from 4.4 percent a year earlier. Jeep posted a record year with over 1.4 million deliveries. Despite the emissions investigation, Marchionne has been off to a good start under the new U.S. administration. His $1 billion plan to produce in the U.S. three new Jeeps and a Ram pickup now made in Mexico won plaudits from President Donald Trump as he pressures the auto industry to manufacture north of the border. Trump, at a meeting with Marchionne and other CEOs at the White House earlier this week pledged to ease off on environmental rules and taxes and offered incentives to draw new carmaking plants to the U.S.
FCA, which has benefited from growing demand for larger cars, including its Ram pickup trucks and Jeep SUVs, stands to gain more than its peers from looser environmental regulation. Reuters, Bloomberg and Philip Nussel of Automotive News contributed to this report.